Sri Bilvamangala Thakura, a great acarya of the Visnu Svami Vaisnava sect, in his householder life was overly attached to a prostitute who happened to be a devotee of the Lord. One night when the Thakura came to Cintamani’s house in torrents of rain and thunder, Cintamani was astonished to see how the Thakura could come on such a dreadful night after crossing a foaming river which was full of waves. She said to Thakura Bilvamangala that his attraction for the flesh and bone of an insignificant woman like her would be properly utilized if it could be diverted to the devotional service of the Lord to achieve attraction for the transcendental beauty of the Lord. It was a momentous hour for the Thakura, and he took a turn towards spiritual realization by the words of a prostitute. 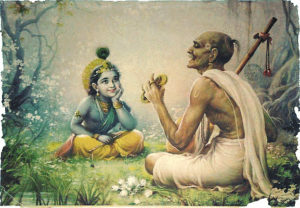 Later on the Thakura accepted the prostitute as his spiritual master, and in several places of his literary works he has glorified the name of Cintamani, who showed him the right path.